A note on this image. This is a photo of the actual shroud of Guadalupe. Over time the image, as it appears on the shroud as it has been popularized (see below), was altered. Specifically, the golden rays surrounding her were added. The rocks upon which she stands were painted over with the image of the angel holding her up from below. The crescent moon was also an added at a later date. These have been removed from this image so as to show the robe as it originally appeared. Our Precious Lady of Flowers first gifted the World her presence on December 12, 1531. Our Lady of Guadalupe. Xochiquetzal. Tequantlanopeuh, Tonantzin, Coatlalopeuh. In other cultures she is referred to as Quan Yin, White Buffalo Calf Woman, Star Woman. She is the brilliant blue star in the leading foot of the constellation Orion: the star Rigel. By whatever name she is known, her visage is immediately recognized, revered and renowned. Her spiritual essence is that of the Celestial aspect of the Divine Feminine. The nature and gift of Our Precious Lady of Flowers is that of Mercy and Grace. On the morning of December 9, 1531 a physical apparition appeared before a native Nahua man, Juan Diego, on the Hill of Tepeyac, near Mexico City. The Aztec goddess of love and fertility, Tonantzin (in Nahuatl “Our Revered Mother”), who also went under the name of Coatlícue (“The Serpent Skirt”) had had a temple dedicated to her on the very Tepeyac Hill where Juan Diego was visited by her apparition, a temple which had recently been destroyed by the Catholic authorities. 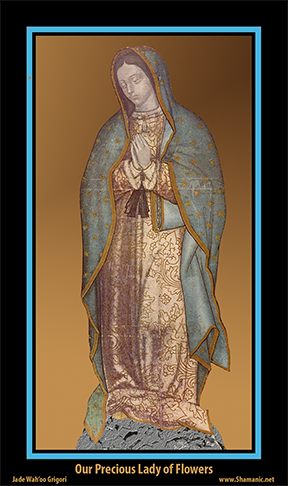 Two Nahuatal names that sound similar to “Guadalupe”, Tecuatlanopeuh, “she whose origins were in the rocky summit”, and Tecuantlaxopeuh “she who banishes those who devoured us” give further credence to the understanding that She (by whatever name) was not a Catholic manifestation of Mary. Far from it. 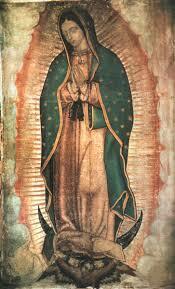 Guadalupe (I use here her commonly known name) was the re-emergent Sacred Celestial Feminine. She is the brilliant blue star in the leading foot of the constellation Orion: the star Rigel.On the Day of Guadalupe, December 12, the star Rigel is at zenith (directly overhead) precisely at midnight. Synchronistic alignments such as this bespeaks to the Shamanic authenticity of December 12th as being a highly significant day to attest to her manifestation upon this earth. In 1996 I found myself traveling the western US in my motor home. While visiting dear friends in Santa Cruz, California, they told me of an incident in one of the regional parks that had stirred quite a buzz. It seems that a Hispanic grandmother had been going to Pinta Park, in Watsonville, California on a daily basis. There she had been making prayers, supplications, to Our Lady of Guadalupe, asking for her intervention on behalf of her own grandchildren who had fallen to drugs and a gang related lifestyle. The story goes that on one particular day a whirlwind came moving across the small lake in the park and rushed towards the grandmother. It stopped moving, though still spinning, right in front of the elder woman. In the midst of the whirlwind was Guadalupe! Our Lady of Guadalupe told the grandmother that her prayers had been heard and that she was to have no more c0ncern for her grandchildren, that they would be fine. Then the whirlwind sped off back across the lake and slammed into a tree that stood there. The tale went that one could see the image of Guadalupe in the tree, still. Well, this was certainly something that I wanted to see for myself! I drove to the park, and without difficulty found the lake. The tree described was even easier to find, draped as it was in ribbons, with testimonial notes of miraculous healings tacked to the limbs, and votive candles adorning the circumference of the tree’s base. I studied the tree and, indeed, the features of Guadalupe could be discerned in the outline of a long-ago fallen branch’s scar upon the trunk about ten feet up. The characteristic tilt of her head, the flowing robes about her body, all were visible. Even was there a radiance emanating from her formed by a light dusting of fungus. Yeah, ok, I get it. I thought to myself how Spirit had to work through the ways of the world, and these elements were the artistic media utilized to create her image. I was fine with that. Now, while I am not at all a respecter of religions, I am whole-heartedly an avowed embracer of Spirit, and clearly here before me was the workings of Spirit made visible. In my own manner of recognition of Spirit, I knelt down and rolled a tobacco to be used as an offering to the Spirit of this manifestation of Guadalupe. I drew the first puff of smoke into my mouth and then lifted my hands and eyes upwards to direct the sweet smoke towards the image of Guadalupe high up in the tree: Phhhheeeeewwwhhhhh! “Oh, but you pray with me all the time” she responded. “I do? !” I burst out. I put the pieces together rather quickly: Guadalupe, with her robe of roses, Xochiquetzal (the Divine Feminine Goddess whose intercession is called upon in the second round of the Bear Lodge of Purification), known as Our Precious Lady of Flowers… it added up! I had never seen the connection before, and here it was – here She was! – standing right in front of me! I was, to say the least, humbled. “What can I do for you?” I asked with gusto. She was gone. No Star Trek shimmering fade, no slow dissolve. My eyes never diverted. She was, then she was no longer. I finished praying my tobacco, sending puffs of smoke upwards to the tree, to Our Precious Lady of Flowers, expressing gratitude in my awe at the gift of her announcement that she had just entrusted to me. I drove back to the home of my friends in Santa Cruz, a deep peace having overcome me. I spoke little of what had transpired, not yet ready to address the immensity of the experience. Only occasionally have I told the full story of that event. Here, for the first time, I speak it to the World. And in my sharing, I encourage you to seek her intercession – by whatever name you know her – should you find yourself, in these trying times of change, lost to despair. Call upon her. She has asked you to do so. Don’t worry about the words, or getting the name right. Don’t get caught up questioning whether your situation is deserving of her assistance. If it is, she will respond. Go ahead. Call her. Our Precious Lady of Flowers.